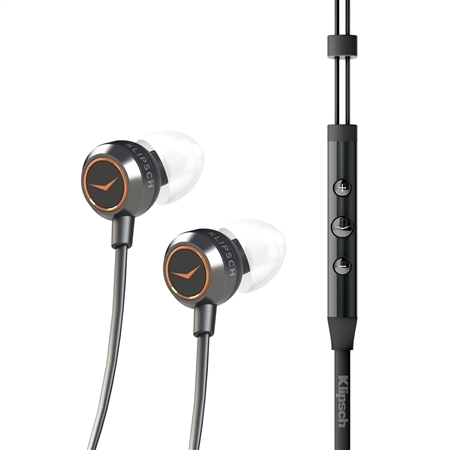 INDIANAPOLIS (August 5, 2013) — Klipsch, a leading global speaker manufacturer, today announces the launch of its X Series headphones complete with the all-new X11i and X4i. Available in premium, super-premium and ultra-premium models, the brand’s flagship offering represents its finest achievement in headphones and utilizes superior materials that cater to on-the-go listeners demanding quality, design, style and performance. Crafted from milled aluminum and available in a black finish, the Klipsch X11i (U.S. MSRP $349.99) employs a wealth of micro-technology to deliver a high-energy listening experience. Accessorized with tangle-resistant cabling and an Apple-compatible three-button mic and remote, the X11i’s audiophile-grade performance delivers the Klipsch sound signature at its best. The featherweight X11i serves as the brand’s smallest and lightest headphone. Originally launched in August 2012, the Klipsch X7i (U.S. MSRP $199.99) is included in the X Series but with an upgrade to the new museum-style pedestal packaging. In addition to offering a sophisticated, sleek black or white finish with laser-etched logos, the headphone’s sculpted ceramic body provides listeners with an elegant design and significant durability. Constructed from die-cast metal, the Klipsch X4i (U.S. MRSP $149.99) offers a timeless industrial design that is lightweight, durable and comfortable. Available in black finish with copper and brushed metal accents, the headphone also features the brand’s tangle-resistant cabling and a three-button mic and remote for seamless control of music and phone calls on Apple devices. Equipped with the patented oval ear tips for which Klipsch is known, the X Series’ headphones allows for endless hours of comfortable wear. Unlike circular-shaped ear tips that put stress at the pressure points inside the ear, Klipsch patented oval ear tips naturally fit the contours of the ear canal, providing comfortable long-term wear. These ear tips also offer superior noise isolation (or passive noise-cancellation), blocking out almost all ambient noise and providing excellent bass. Oval ear tips fit best, feel best and only Klipsch has them. Inside the X Series products feature exclusive, full-range balanced armature drivers with tuned bass-reflex systems that deliver lifelike dynamics, sonic clarity and rich bass. The Series’ luxury is carried over into the packaging that provides a 360-degree view of the products. Each X Series model’s audio works with virtually any device that has a standard 3.5mm headphone jack; however, the mic and three-button remote support select Apple products. Included with purchase of the X7i and X11i are five different-sized oval ear tips, a protective carrying case, clothing clip and two-year warranty. The X4i provides the same only with four different-sized ear tips. All X Series models are now available at authorized retailers and http://www.klipsch.com.